Chappaquiddick is the name of a small island, about six square miles, just off of Martha's Vineyard south of Cape Cod, Massachusetts. Most of it is conservation land held by the Trustees of Reservations, a private organization. 6 "I will take care of the accident"
It is most famous as the location of an event known as the "Chappaquiddick incident," or simply "Chappaquiddick." 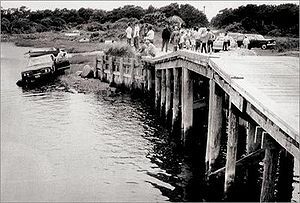 The narrow bridge connecting Chappaquiddick Island to Martha's Vineyard was the location of the death of a young woman, Mary Jo Kopechne, in a car driven by Senator Ted Kennedy on July 19, 1969. This became one of the most famous political events of the late 20th century and likely prevented Ted Kennedy, the brother of President John F. Kennedy, from ever becoming president himself. "On July 18, 1969, at approximately 11:15 PM in Chappaquiddick, Martha's Vineyard, Massachusetts, I was driving my car on Main Street on my way to get the ferry back to Edgartown. I was unfamiliar with the road and turned right onto Dike Road, instead of bearing hard left on Main Street. After proceeding for approximately one-half mile on Dike Road I descended a hill and came upon a narrow bridge. The car went off the side of the bridge. There was one passenger with me, one Miss Mary ________ [Kennedy did not know how to spell the woman's last name], a former secretary of my brother Sen. Robert Kennedy. The car turned over and sank into the water and landed with the roof resting on the bottom. I attempted to open the door and the window of the car but have no recollection of how I got out of the car. I came to the surface and then repeatedly dove down to the car in an attempt to see if the passenger was still in the car. I was unsuccessful in the attempt. I was exhausted and in a state of shock. I recall walking back to where my friends were eating. There was a car parked in front of the cottage and I climbed into the back seat. I then asked for someone to bring me back to Edgartown. I remember walking around for a period of time and then going back to my hotel room. When I fully realized what had happened this morning, I immediately contacted the police. More important now than the loose ends of his unsatisfying accounts are the reasons they were left so loose. If Mr. Kennedy used his enormous influence to protect himself by leading a cover-up of misconduct—and the known facts lead to that suspicion—there would hang over him not just a cloud of tragedy, but of corruption, of the Watergate kind. According to the testimony of the other party-goers, Kennedy left the party at around 11:15 or 11:30, and party guest Mary Jo Kopechne asked for a ride back to her hotel. Kennedy drove his mother's 1967 Olds 88. A deputy sheriff later testified that he saw Kennedy's car on Dyke Road at 12:40 am, and that the driver sped off when he approached it. According to Kennedy, he made a wrong turn onto an unlit dirt road that led to Dike Bridge, a wooden bridge angled obliquely to the road with no guardrail, and drove over its side. The car plunged into tide-swept Poucha Pond (at that location a channel) and came to rest upside down underwater. Kennedy later recalled that he was able to swim free of the vehicle, but Kopechne was not. Kennedy claimed at the inquest that he called Kopechne's name several times from the shore, then tried to swim down to reach her seven or eight times, then rested on the bank for several minutes before returning on foot to Lawrence Cottage, where the party attended by Kopechne and other "Boiler Room Girls" had occurred. According to one commentator, his route back to the cottage would have taken him past four houses from which he could have telephoned and summoned help; however, he did not do so. "I will take care of the accident"
According to their later testimony, Gargan and party co-host Paul Markham then returned to the pond with Kennedy to try to rescue Kopechne. Both of the other men reported that they also tried to dive into the water and rescue Kopechne multiple times. When their efforts to rescue Kopechne failed, Kennedy claimed that he said to the others, "You take care of the other girls and I will take care of the accident". According to Gargan and Markham, they then returned to the cottage and told the women nothing, at Kennedy's request. According to Gargan and Markam's testimony, they assumed that Kennedy was going to inform the authorities once he got back to Edgartown, and thus did not do so themselves. Kennedy decided to return to his hotel; however, the Edgartown-Chappaquiddick ferry (which connects Chappaquiddick to the rest of the island) had shut down for the night, so Gargan and Markham drove Kennedy to the ferry crossing and Kennedy then swam across the 500-foot channel, back to Edgartown, where he fell asleep on his hotel bed at around 2 am. Back at his hotel, Kennedy complained at 2:55 am to the hotel owner that he had been awoken by a noisy party. By 7:30 am the next morning he was talking "casually" to the winner of the previous day's sailing race, with no indication that anything was amiss. At 8 a.m., Gargan and Markham joined Kennedy at his hotel where they had a "heated conversation", even though the ferry operator did not see them take the ferry to get to Edgartown. The three men subsequently crossed back to Chappaquidick Island on the ferry, where Kennedy made a series of phone calls from a payphone by the crossing to his friends for advice; he again did not report the accident to authorities. Police checked the car's license plate and saw that it was registered to Kennedy. When Kennedy, still at the pay phone by the ferry crossing, saw that the body had been discovered, he crossed back to Edgartown and went to the police station: Gargan simultaneously went to the hotel where the Boiler Room Girls were staying to inform them about the incident. Kennedy discussed the accident with several people, including his lawyer and Kopechne's parents, before discussing it with the police the next morning. Ted Kennedy is still sometimes referred to sarcastically as the Hero of Chappaquiddick. This page was last modified on 24 June 2016, at 10:40.